Can you please instruct me how to do this? Not Valid for PRTG Version 12 or Later! PLEASE NOTE: The information in this article does not apply to PRTG Network Monitor 12 or later! This article applies to PRTG 8. 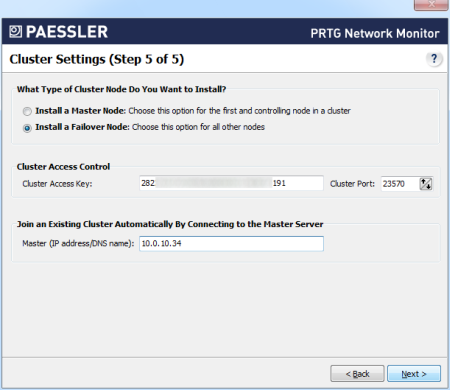 This article explains how to set up a cluster of two servers (master node and failover node) with PRTG Network Monitor 8. 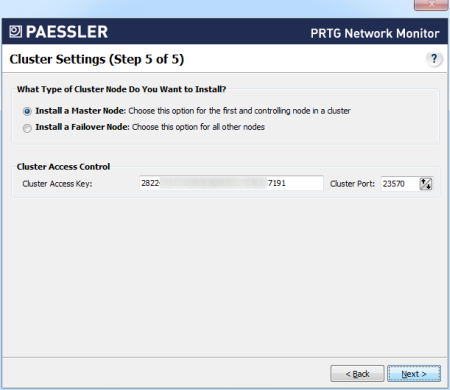 Important: Before getting started, please make sure you've read the introduction: How do I set up a cluster in PRTG 8? It contains important hints and preparation steps you should consider before proceeding. Additionally, you will find there links to instructions on how to set up other scenarios. Your aim: Make a fresh installation of two PRTG version 8 servers as a cluster —or— integrate one existing PRTG version 7 server into a cluster of two PRTG version 8 installations. 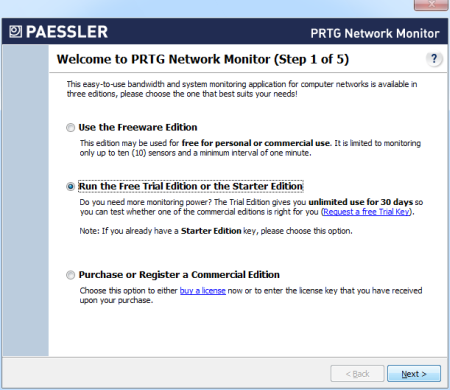 On “Master Node“ server, execute the PRTG Network Monitor Setup program. Follow the installation wizard and license instructions. Enter the essential settings and click on Next. In the Cluster Settings (Step 5 of 5) on “Master Node“ server, select Install a Master Node. A Cluster Access Key is automatically generated and does not have to be changed. You can leave the standard setting for Cluster Port. Save both cluster access key and port number in a text file for later use; you will need it in the cluster settings on “Failover Node“ server. — On “Failover Node“ server, execute the PRTG Network Monitor Setup program. Follow the installation wizard. You will eventually see the cluster mode selection (step 4 of 5). 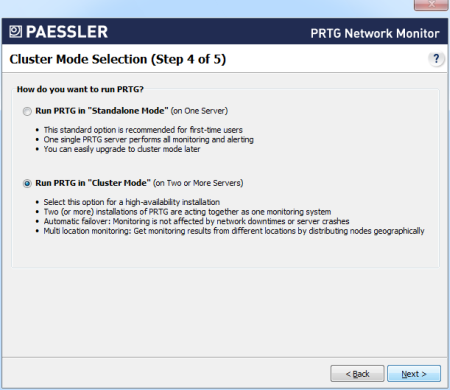 — Once you’ve reached the Cluster Mode Selection (Step 4 of 5) on “Failover Node“ server, select Run PRTG in “Cluster Mode” and click on Next. — In the Cluster Settings (Step 5 of 5) on “Failover Node“ server, select Install a Failover Node. Insert the password and port number into the Cluster Access Key and Cluster Port fields. You’ve saved this information before during setup on the “Master Node” server. In the Master field, enter the IP address or DNS name of your “Master Node” server. Now you need to confirm the new failover node by setting it to Active in the master node's settings. In a browser window, log into PRTG’s web interface of the “Master Node” server. Choose Setup (screwdriver symbol) | System Administration | System Setup from the main menu and click on the Cluster Settings tab. You will see your “Master Node” server in the first line of the cluster list and your “Failover Node” server below. 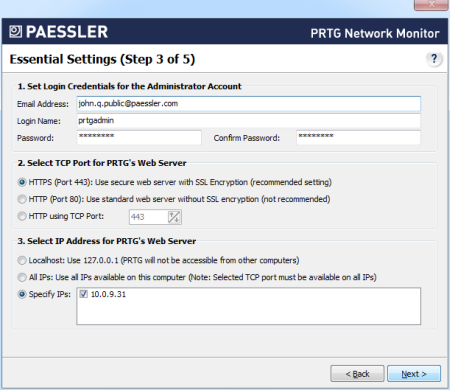 In two browser windows, log into PRTG’s web interfaces of both of your PRTG installations. Open the cluster status page in both windows by clicking on the narrow cluster information bars at the top of each window. 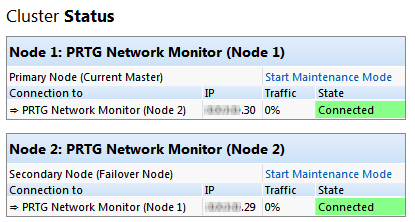 You should see a cluster status with your two nodes in a Connected state after a few minutes. the core server log file, a text file in the logs directory of your PRTG installation (see How PRTG Network Monitor Stores its Data). In the latest entries of these logs, you can see messages about any errors that might have occurred. These will give you hints on where to find a solution. If you encounter connection problems between the two cluster nodes, please make sure that no software- or hardware firewall is blocking communication on the cluster port defined during cluster setup. Communication between the nodes must be possible in both directions in order for the cluster to work properly. That’s it. You’ve now successfully set up your failover cluster. All devices that are created or moved under the Cluster Probe will be monitored by all servers in the cluster. Please repeat Step 4 to Step 9 for each additional failover node you want to set up. What's the Clustering Feature in PRTG 8? How do I set up a cluster in PRTG 8?